Lose track of the miles. The longest-lasting tire among leading competitive tires. Drive on and rack up the miles. 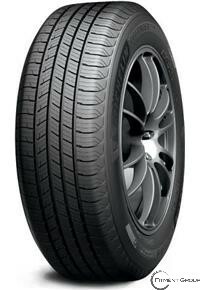 Our MaxTouch Construction™ is designed to ensure the tire contact forces are evenly distributed - maximizing treadlife. And our durable EverTread™ compound offers long-lasting dependability. Escape compromise. Miles of uncompromised safety performance. Leave worries behind and hit the road with confidence. Our IntelliSipe™ technology is designed to maximize biting edges for exceptional grip and control in all seasons, while special rain grooves help prevent hydroplaning. Get there comfortably. Designed to deliver a quiet, comfortable ride. Experience miles of quiet and comfort wherever you go. Our Comfort Control Technology™ helps ensure ride satisfaction while minimizing noise with the road.